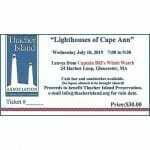 “Lighthouses of Cape Ann” –Wednesday July 10. 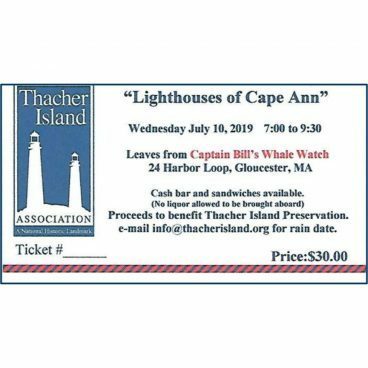 Departs at 7 p.m. from Captain Bill’s Whale Watch, 24 Harbor Loop, Gloucester, aboard the 100-foot Miss Cape Ann. 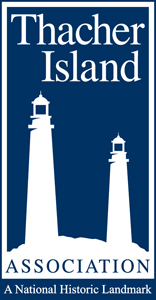 This three-hour narrated sunset cruise up the Annisquam River and around Halibut Point will pass all six of Cape Ann’s lighthouses, including the Twin Lights of Thacher Island, before returning via Eastern Point to Gloucester Harbor. Snacks and sandwiches available (or bring your own), plus cash bar. Donation is $30 per person. Credit Cards accepted. Tickets should be picked up at the boat the evening of the cruise must have reservations.